The Gold Coast Airport (OOL) connects travelers to Australiaâ€™s beautiful Gold Coast and various domestic and international destinations. 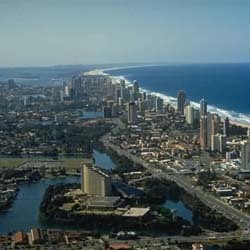 Formerly known as Coolangatta Airport, the Gold Coast Airport is located in the suburb of Bilinga in the eastern Australian state of Queensland, the so-called 'Sunshine State'. The Gold Coast Airport handles over three million passengers every year - with half of domestic visitors to the Gold Coast area now arriving via the Gold Coast Airport. As one of the fastest growing airports in Australia, the Gold Coast Airport continues to meeting growing demand for flights to the region after a A$17 million airport upgrade in 2002. The Gold Coast Airport serves 17 destinations in Australia, New Zealand, and Asia, including Tokyo, Hong Kong and Singapore. The Gold Coast Airport provides regular daily domestic flights from Sydney, Melbourne, Adelaide, plus connecting flights to all other Australian cities. Services to and from New Zealand have seen particularly strong demand in recent years. The terminals at the Gold Coast Airport offer many facilities, which include Travelex currency exchange booths, transport and information desk, accommodation booking board and Internet / e-mail access. Short, long-term and disabled parking are provided. The Gold Coast Airport also offers car rental services through major car rental companies such as Avis, Hertz, Thrifty, Budget, Ascot Car Rental and Europcar. The Gold Coast is one of Australiaâ€™s most popular vacation destinations and makes an excellent base from which to explore Queenslandâ€™s headline attractions such as the Sunshine Coast, the rainforest and Great Barrier Reef. The Gold Coast World Airport Guide provides you with access to a complete selection of Gold Coast airport hotels. Utilize the discounts offered directly from the hotel, with the assurance of secure booking. Extra services include airport car rental, airport car parking and flights to and from Gold Coast Bilinga Airport. Please note: The term Gold Coast Airport OOL as well as all associated graphics, logos, and/or other trademarks, tradenames or copyrights are the property of the Bilinga Airport authority and are used herein for factual descriptive purposes only. We are in no way associated with or authorized by the Bilinga Airport authority and neither that entity nor any of its affiliates have licensed or endorsed us.